NEW TRANSLATED VIDEO KH BIRTH BY SLEEP http://www.veoh.com/videos/v141529808hzPY8rz?autoWatch=true TRANSLATIONS 荒野でKH2FM＋のシークレットムービーに登場した老人と対峙するテラ。 Terra confronts the old man from the KH2FM＋ secret movie at the wasteland. ゼアノート「お前ならば　辿り着くと信じていた――」 Xehanort: I believed you’d find your way by now―― ゼアノート「光と闇の壁を越え、私の元へ」 Xehanort: Cross the wall between the light and darkness, to me ゼアノート「待ちわびたぞ、テラ」 Xehanort: I’m tired of waiting for you, Terra 老人は嬉しそうに手を広げる。逆にテラは険しい表情。 The old man offers out his hand. Oppositely, Terra makes a grim face. テラ「…俺には『友』がいる」 Terra: …I have a “friend” テラ「答えろゼアノート、あいつの心に何をした！！」 Terra: Answer me, Xehanort. What have you done to his heart?! テラが右手にキーブレードを呼び出す。 Terra summons a keyblade into his right hand. ___________ In between these cutscenes they show the footage of playing the game as Terra. ___________ 既存ゼアノートはヴェンとオリンポスコロシアムで出会う。 An encounter between Xehanort and Ven at Olympus Coliseum. ヴェン「誰だ？　あんたに会ったことなんか…」 Ven: Who are you? As for having met you… 何かを思い出したように驚くヴェン。 Ven seems surprised at having remembered something. ゼアノート「そうだ、お前は失っている。」 Xehanort: Seems that you’re losing it. ゼアノート「しかしそれは永遠の喪失ではない　手に入れるために失ったのだ！」 Xehanort: However, you haven’t lost it permanently. In order to obtain it, give up. ゼアノート「今こそ全てを取り戻し、真実を掴み取るのだ！」 Xehanort: Now recover everything, and discover the truth! 老人が手で魔法？を発動、ヴェンは混乱と恐怖に陥ったような表情。 The old man releases magic from his hands, Ven’s expression becomes confused and fearful. ___________ その後、舞台は再び荒野に。 Afterwards, the scene changes again to the wasteland. ヴェンと、黒いヘルメットと鎧に身を包んだ人物（KH2FM＋のシークレットに登場した人物） Ven and the character wearing a black helmet and armor (The person who appeared in the secret of KH2FM +) are there. 謎の人物に吹っ飛ばされるヴェン。 The mysterious character throws back Ven. ゼアノート（声だけ）「闇に染まってしまった者に、キーブレードを扱う資格はない」 Xehanort (Voice only): Those that submit to darkness are not qualified to wield the keyblade. \ ヴェンが顔を上げると筋肉スーツが迫ってくる。 When Ven lifts his face, Mickey approaches ___________ ディスティニーアイランド Destiny Island 夕暮れ時、海岸を見つめるテラ Terra stares at the shore as the sun sets. \ テラが見つめる先には、木立を剣代わりに遊ぶ二人の少年（おそらくソラとリク） Terra stares onward at two boys sword fighting near a grove of trees. (Perhaps it is Sora and Riku) （周囲にはテラとその二人しかいない） (Only Terra and and the two boys are around.) ___________ 今までとは一変し、何かを訴えかけるような表情の老人。 In the wasteland, the old man’s face changes completely into an expression of yearning. ___________ レイディアントガーデンのような岩場 In a rocky place like Radiant Gardens, Terra carries the collapsed Ven in his arms. テラ「マスターだろうと関係ない。この力、友のために使う！！」 Terra: I don’t care about being master. This power, I use for my friends!! ___________ ディスティニーアイランド Destiny Island 夕暮れ時に海岸を見つめるヴェン。 Ven stares at the shore as the sun sets. うつむき加減で、少しくらい表情のヴェン。 He is looking downward with a despondent expression. 「『友達』だから頼みたいんだ、俺を、消してくれ」 We’re friends, therefore I wanted to ask something. Erase me. first of all go to top of your screen.second click on profile.then when youre in your profile go to top left hand side and click on avatar.tada then upload.signature is the same except when youre in your profile instead of going to avatar you go to signature.tada now upload. Everything Kingdom Hearts here. Discuss about your favorite charchters, worlds, keyblades, etc. 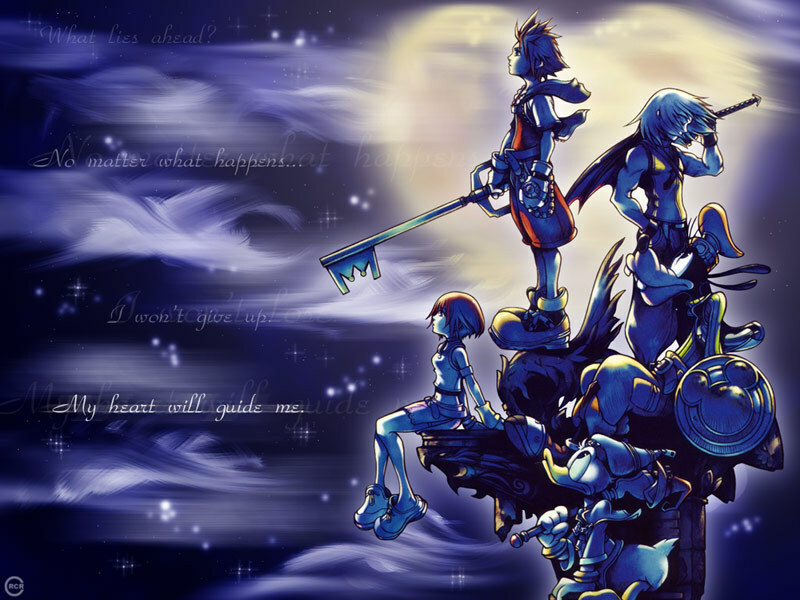 Everything Kingdom Hearts 2 here. Talk about anything Kingdom Hearts 2 related. Anything about Kingdom Hearts 3 we would like to know. Discuss theories and opinions, give others info on the Kingdom Hearts series, etc. Any Issues you would like to talk about that is goin on in the forum plaese tell us and they will be considerated. This a place for personal stuff. ABSOLUTELY NO SPAMMING HERE!!!! !